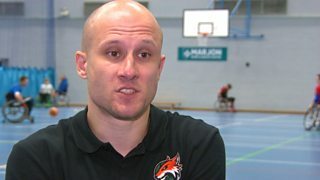 Aaron Blyth-Palk, who set up the Plymouth Storm Wheelchair Basketball team, wins the BBC Get Inspired Unsung Hero Award for the South West. Aaron, who was paralysed in 2005 after falling more than 100 feet from a cliff, is officially the club secretary, but also manages and coaches the team and leads the fundraising. He also works extensively with local schools, helping pupils understand more about disabled people. Visit our special guides for how to get into basketball or volunteering.